You are currently browsing the archives for the Knee Replacement category. When you run out of treatment options for your knee osteoarthritis the time may come for you to have your knee replaced. This surgery involves removing your knee and replacing it with prosthetic components. The bottom of your femur, your knee cap, and the top of your tibia will all be cut out. There are three compartments that comprise the knee joint: one in the front of the knee (patellofemoral compartment), one on the outside (lateral compartment) and one on the inside (medial compartment). Patient with osteoarthritis that affects only one of the three compartments, may be a candidate for a unicompartment knee replacement. 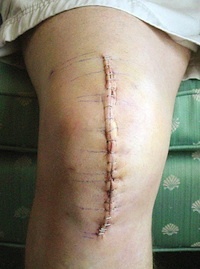 Unicompartment knee replacement is when only the diseased compartment is replaced with titanium and plastic components. The advantages to a patient that receives a partial knee replacement compared to a total knee replacement is that the recovery time is quicker, there is less blood loss, the knee may bend easier, and there is less pain after surgery. And since less bone, ligaments, and cartilage are cut out most patients say that a unicompartmental knee replacement feels more like their real knee as compared to a total knee replacement. There are two major disadvantages of a unicompartmental knee replacement compared to a total knee replacement. The first is that the pain relief is less predictable. The knee is a complicated joint – doctors don’t always get it right. Also and more importantly there is a strong potential for additional surgery. If the healthy parts of a patient’s knee continue to deteriorate after the unicompartmental knee replacement, then a total knee replacement may still be necessary. The primary goals of knee replacement surgery, whether it be a total or a unicompartmental replacement are a decrease in pain and an increase in function. Why not consider a surgical alternative? Bio-Mechanical knee braces (also called unloading knee braces or off-loading knee braces) are designed to relieve pain and increase function in patients with unicompartmental osteoarthritis. The perfect candidates for a unicompartmental knee replacement are also the perfect candidates for knee braces! An arthritis knee brace is meant to buy time and post-pone surgery. Science published in the Journal of Bone and Joint Surgery proves bio-mechanical knee braces increase function and decrease pain in patients suffering with knee osteoarthritis.